Tales from the Real OC (Really! ): FATED Release and Tour Dates! 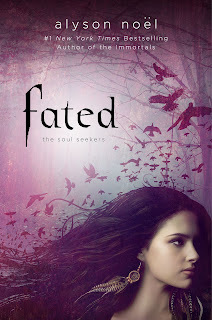 I can't believe the release of FATED is almost here! Writing this book has been such a blast and I hope you have as much fun reading it as I did writing it! There will be a ticketed tea in the afternoon, details can be found here. I had the opportunity to visit New Mexico while doing research for the SOUL SEEKERS and I can’t wait to return and see some familiar faces—plus meet readers in a few cities I haven’t had the chance to visit yet! FATED has also been named a TOP PICK by RT Magazine and a PW PICK by Publishers Weekly! "The first Soul Seekers urban fantasy is a superb thriller starring a "troubled" young lady who learns she holds the fate of the world in her hands. The key to this absorbing tale is the heroine who makes the Noel mythos seems genuine as she enters the underworld in a soul searching rescue mission while wondering whom does she trust. Filled with twists, this is a winning opening act." The FATED trailer will be released on Tuesday, so stay tuned for that! I’m so thrilled with the way it turned out and I can’t wait to share it with you, but until then, here are a few preview pictures as featured on Maximum Shelf! Okay, that’s all for now—more news coming soon! And don’t forget to visit the SOUL SEEKERS official website to build your own dream catcher, find your animal spirit, and more! Any chances you'll be in Oregon or central California for your tour? Hello alyson do u know if u would be close to fresno ca, i would love to meet you, you are truly an insperation. Hi Teela - Thanks so much for your kind words and support! I'll be sure to announce if I'm signing in the Fresno area. Hope you continue to enjoy the books! how many books is going to be ? i read your first 3 books on Soul Seekers in greek .